The raising of children, their role in society, and the degree to which family and community is structured around them, varies quite significantly around the world. The Anthropology of Childhood provides the first comprehensive review of the literature on children from a distinctly anthropological perspective. Bringing together key evidence from cultural anthropology, history, and primate studies, it argues that our common understandings about children are narrowly culture-bound. Whereas dominant society views children as precious, innocent and preternaturally cute 'cherubs', Lancy introduces the reader to societies where children are viewed as unwanted, inconvenient 'changelings', or as desired but pragmatically commoditized 'chattels'. Looking in particular at family structure and reproduction, profiles of children's caretakers, their treatment at different ages, their play, work, schooling, and transition to adulthood, this volume provides a rich, interesting, and original portrait of children in past and contemporary cultures. A must-read for anyone interested in childhood. "the scope of this book is vast, bringing in findings from primatology, as well as ideas from evolutionary and biological anthropology, to give a well rounded and comprehensive guide to children's lives in many parts of the world." --American Ethnologist (2009) 36: 823-824. "will provide essential reading for a broad audience interested in how children are imagined and treated in different societies as well as in different historical epochs." --Journal of the Royal Anthropological Institute (2010) 16, 171-173. 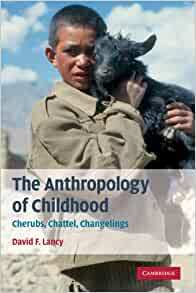 Bringing together key evidence from cultural anthropology, history, and primate studies, Lancy introduces the reader to societies where children are viewed as unwanted, inconvenient 'changelings'. Enriched with vivid anecdotes, evocative photographs and written in a politically balanced style, this class-tested text is a must-read for students and practitioners alike. The book is definitely scholarly. It's not easy reading. However, it is filled with details, and goes far beyond any popular book I've ever read on the subject. Be prepared to spend many days reading this book. Perhaps weeks, unless you are totally focused on the subject. My own criticism is that there is much less about fathers than about mothers. Yes, I know that in most societies, fathers are almost totally uninvolved in child-rearing especially in the early years. However, I would have liked to read more. 5.0 out of 5 starsChildhood -- What a Range of Options! No swipe at Dr. Spock or Maurice Sendak, but this is the best book on childhood and child raising published in English. The author, a professor emeritus of anthropology, summarizes by major themes the available scholarly literature on child raising practices around the world. The range of practice from culture to culture is so wide that the mind boggles -- and is cheered. Lancy draws a clear distinction between the current child-centered practices of Europe, North America, and East Asia and those of traditional societies where children are much less central to parental/adult life. Lancy's asides on the quest for perfection and safety for children in post-modern societies overlap nicely with the writings of Lenore Skenazy and others. This is a substantial meal. It is well worth grazing on in chunks, over a period of time. You won't regret it. I'm a first time parent, interested in the impossible questions about the best way to raise my child, and I find this book endlessly fascinating and useful. If you are interested in cross-cultural issues, the endlessly variable ways children are raised across cultures and times, and want to know some outer parameters within which to choose your own path -- this book might also be a good read for you. Yes, it's quite academic, but that also means the author tries to be as nonjudgmental and objective as possible. I was a little overwhelmed by the book when I received it. It looks like a text book and I'm reading it more slowly than my usual pleasure reading pace even though it does not read as "heavy" as a text book. It is extremely thorough, insightful, fascinating and I would highly recommend it. Possibly because I have the Kindle edition, this book was confusing and cumbersome to read. Footnotes appeared at the end of chapters, when they were so dependent on the associated text that they must have been meant to sit at the bottom of the pages. There were so many links to source materials that it was hard to turn a page without being catapulted into the reference list - - a one-way trip, from which it wasn't readily possible to return to the same page. Those are the quibbles. The book is unfocused; quote after quote illustrates the point that there are a lot of ways to be born and grow up, but it is hard to tell when the quotations end and the author's own voice is heard. The tension between including every single possible reference and producing a readable book seems to have been resolved in favor of the former. (Except for the one area of greatest interest to me - - just what do we know about the beliefs about changelings? Did ending the outright killing or the neglect of "possessed" children cause the increase in autism? On this topic, there is the mention of community approved torture of behaviorally deviant infants, but little discussion of the likely effects on autism prevalence.) The first part of the book presents the wide range of pregnancy and birthing practices, emphasizing that modern American ideas of what's normal are very different from historical norms and the customs of most of the rest of the world. The section on early childhood education also shows American practices to be very unusual. The transition from childhood to adulthood is handled in a number of different ways in different societies, but again, our own practices are very unusual. The author's points are valid. Bringing the anthropological, archeological, historical, and sociological evidence together is helpful. It just doesn't make for compelling reading after a certain point, though I did finish the whole book. When the author's own voice comes through in the later chapters, it is didactic and prescriptive, in contrast to the educational style being espoused, which has the learner discovering ways to do things by observation and trial and error. This book stands as a useful compilation of knowledge, and it is certainly worth reading for people who are going into pregnancy with no knowledge of other cultures or of social history before the middle of the last century. Fascinating review of what childhood is like all over the world. It should be an interesting read for parents, teachers, anyone who spends a lot of time with children. I feel like I've travelled the globe after just a few pages. It's also a really healthy reality check in response to some of the parenting ideas of North America. Very interesting book, but it's dense. It reads more like a text book than anything else, and maybe that's my bad. But this isn't a leisurely read by any stretch.